The brothers Johan and Anders Rensfeldt from Luleå have created music together since they were teens. At that time the music didn’t sound as it does today. By then they had an acoustic sound with only guitar, organ and some percussion. But things changed when they met the saxophonist Joakim Nilsson. Together they toured with the National Theatre and on an after-party in Arvika the trio came to discover the swing. The acoustic guitar was replaced with kettledrums and big band wind - Movits! was born. The first album took three years to complete and involved several musicians. 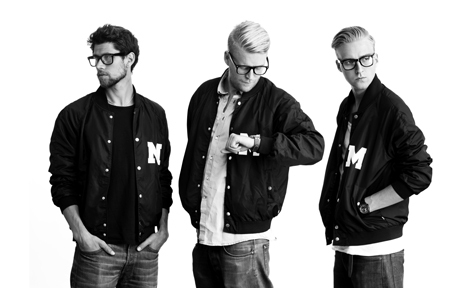 The debut album “Äppelknyckarjazz” was released in 2008 and the break through was huge in US and Europe, despite the Swedish-speaking swing hip hop. It all began the 27th July 2009 with an appearance in the American television show The Colbert Report. They became a huge success and the record sales increased by 85 000 %. And on iTunes they, from nowhere, took first place in the category hip-hop and poked down big names like Eminem and Snoop Dog. The year after that they went on tour through the US and Europe. The goal for Movits! has always been to get people to dance and today we hear them at clubs all around the world.